A mantel that's decorated for the season gives a message to buyers that your home is getting the attention it deserves. And a little attention on your part goes a long way. A few new props that indicate the season, or a different floral arrangement might be all you need to make your mantel look current. 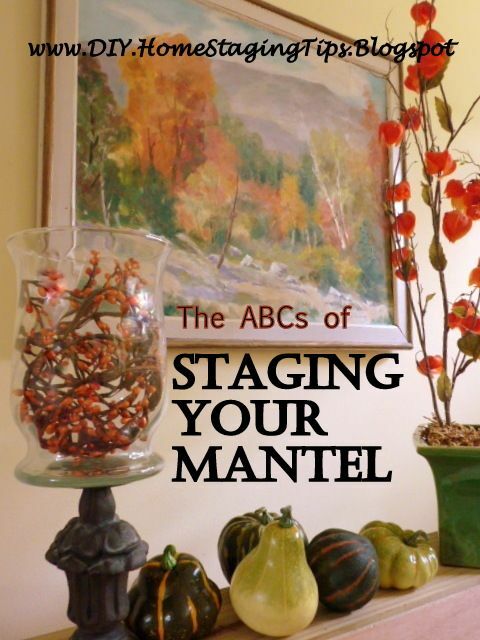 One of the easiest ways to stage a mantel is to start with a painting. A landscape painting is an especially good choice, because landscapes have a way of opening up a space. If the landscape showcases the local scenery, so much the better. 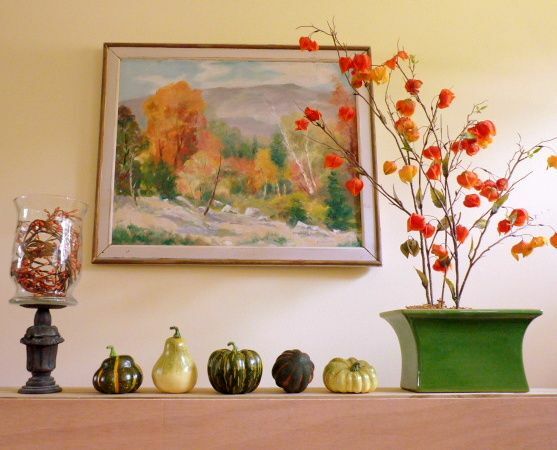 To stage this fireplace mantel for the autumn season, I choose a painting I bought at a garage sale. Since it's an autumn scene, I'm already half way to the look I want. My next step was to hunt for objects that would pick up the colors in the painting. I also wanted to include a variety of textures, of materials, and of shapes. 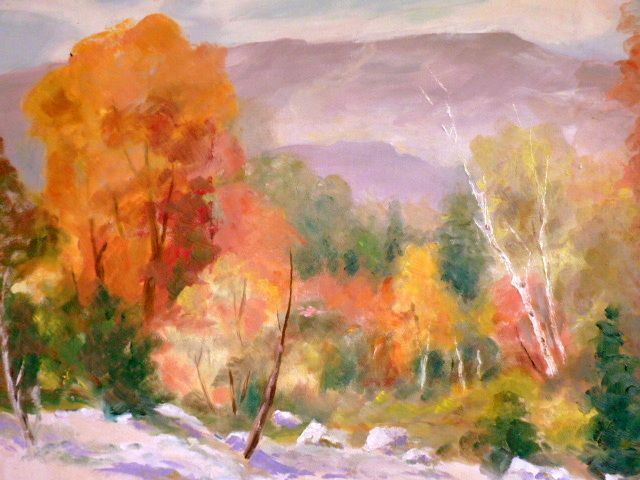 There are plenty of soft and pleasing colors in this autumnal scene. I decided to bring out the greens and oranges with the props I chose, because those seemed the most autumnal. The walls in this room were a soft yellow, an ideal background for the painting. Still life paintings and abstract art are also excellent choices for home staging, providing they are not too distracting or controversial. 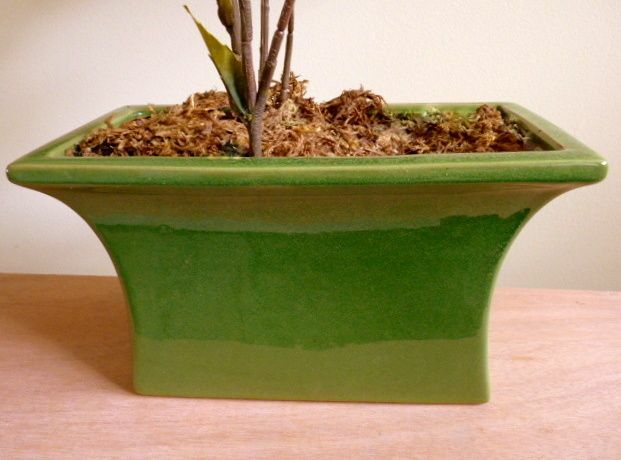 I love the shape of this planter, and I love the reflective glaze. The color is perfect so I knew I'd use it on the mantel. Chances are that you already own the objects you need to stage a mantel in your own home. They should not be too small, too valuable, or too personal. 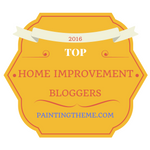 Every home stager keeps an assortment of things like silks, and floral foam, and sheet moss or spaghnam moss to cover up the foam. I pulled out my faux Chinese lantern silks because I knew I didn't want to limit the color palette to greens. The wire stems on these silks were longer than I wanted them to be, but instead of cutting them off, I bent them back a few times. Now, if I need them long again, I just need to bend the stems straight. Even though the flowers are fake, I like to concentrate on flowers that are actually in season, the way I chose alliums and grass for staging this springtime mantel. You can read my suggestions for staging a summertime fireplace here. 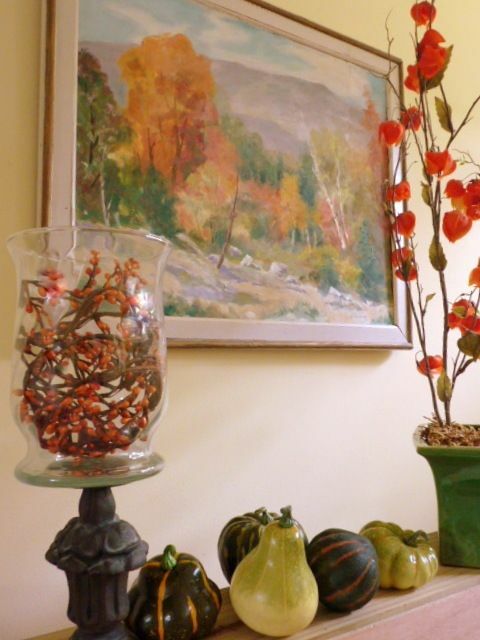 What fall arrangement is complete without seasonal gourds or pumpkins? 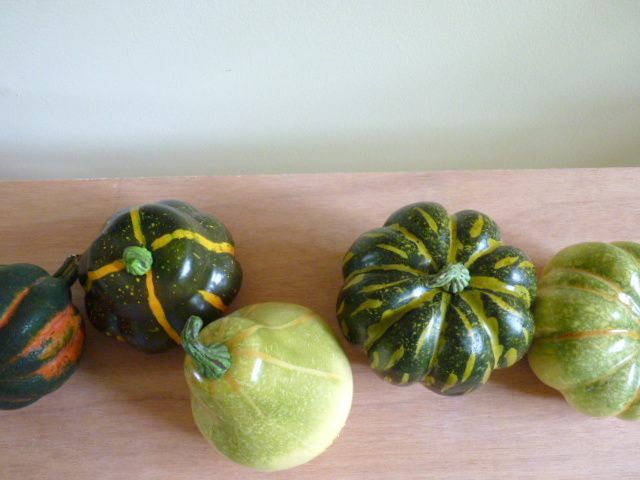 My green gourds are from the dollar store. I used them on a mantel last fall and even after being stored in my garden shed all year, they're in like-new condition. I knew if I needed more things than what I had on hand, I could scavenge in my own neighborhood or backyard for pine cones, twigs, dried flowers, and even rocks. And there's always the recycling bin for interesting cheap staging props that can be painted or otherwise disguised. I used a Michael's coupon to purchase the garland of berries, even though I wasn't sure how I would be using a string of berries. 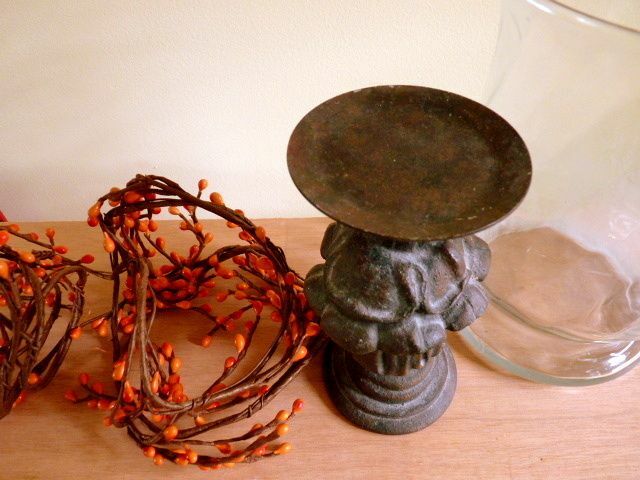 I wanted something metallic and something with a patina, so this candle holder came out of the prop closet. I also wanted some clear glass, so I brought out some vases and chimneys, not sure which ones I would use. I ended up setting this glass vase on top of the candle pedestal to give it height. Often, wide glass vases can look like hurricane chimneys but cost less and are not so fragile. I wasn't pleased with this, my first attempt. The lineup of "marching gourds" looked too sterile, so I clustered them for the more interesting look you see in the top photo. Every tablescape or mantel arrangement calls for some fooling around before it all falls into place. 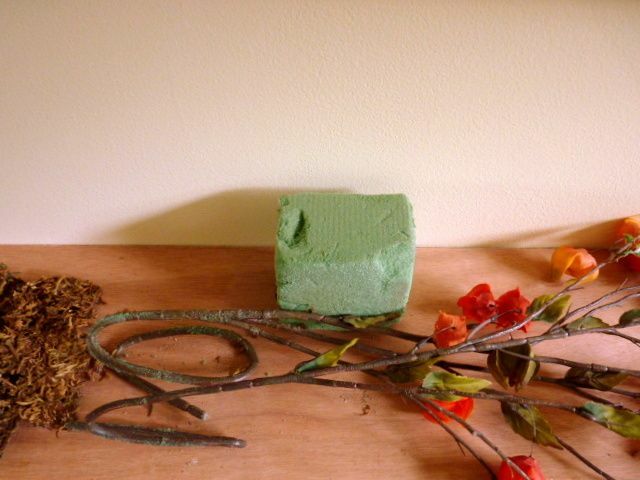 So, gather your props of the season and see what you can create to bring your own mantel to life. 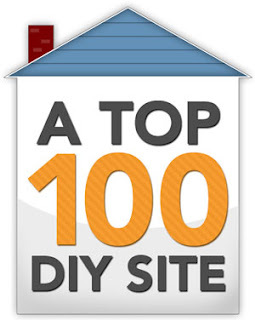 My $4.99 eBook, DIY Home Staging Tips to Sell Your Home Fast and For Top Dollar gives formulas for decorating mantels, as well as guidelines for arranging furniture, choosing paint colors, and all the other decisions you'll make to stage your own home.